I only got my first petticoat last year – I thought it was going to become a staple part of my wardrobe, but in reality I’ve probably only worn it a handful of times. For one, I couldn’t really justify spending the money on a truly quality one a la Vivien of Holloway, and I feel the repercussions in the form of the horrible scratchiness of the netting. The other problem is that a lot of petticoats are available in similar standard lengths and it turns out my 25″ petticoat, at the same length or an inch shorter than a lot of my skirts, has a habit of peeping. I don’t really like my petticoats to show. And of course, there’s the more knee-length skirts that are shorter than 25″ which just don’t work at all. There’s also just something a bit fussy about wearing a big ol’ net petticoat going about your daily business for me, personally. I’m quite happy to put it on for an occasion, but getting in and out of cars to go to the shops bundled in fluff isn’t my thing. That’s why when I first got wind of Pinup Girl Clothing’s canvas underskirt, I got a bit overexcited. No netting, a short length and promising to add fullness without the fuss, based on the underpinnings Dior designed in the 40s and 50s – it was definitely worth a go. And then I read a review that said it quite literally fell a bit flat. I’d already ordered it by this point so it was a bit late to change my mind, but it made me think that sharing my opinion on how it measures up as a petticoat could be useful. So, here is my cotton circle skirt, looking limp and forlorn with no puffery beneath it. Now, let me get something out of the way. I hate ironing but I DID iron this skirt. It’s one of those pieces of clothing that wrinkles as soon as you look at it and all of the wrinkles show up marvellously clearly in photos. There was something about the lighting on this day that captured them particularly perfectly. So there. Anyway, that’s what it looks like on its own. And below is what it looks like with my scratchy 25″ net petticoat underneath vs with the canvas underskirt. I think we can agree that there is virtually no difference in volume here, right? When I was going through the photos I had a hard time working out where the first batch ended and the second batch began, but what gave it away was the slight differences in the shape of the volume. You can just about see on the right that the underskirt gives a bit more volume at the top of the skirt, whereas the petticoat is more of the regular upside-down triangle kind of volume we’re used to seeing from a regular petticoat. So if any of that sounds like the answer to your skirt problems, it might be worth getting your hands on one. They come in a huge range of sizes, which I also appreciate a lot more than the petticoat ‘one size fits all’ approach. 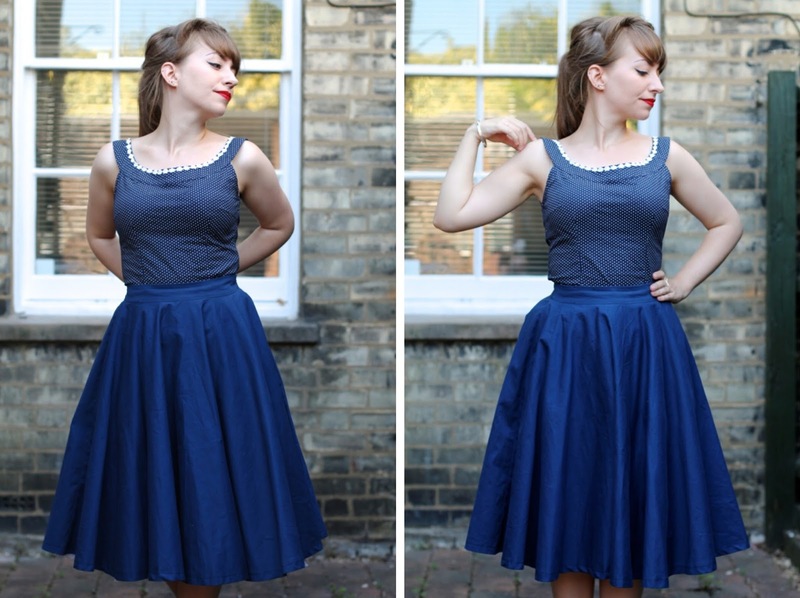 The only word of caution I would say is that it’s never going to give you the fullness a decent quality net petticoat would – and I think the images on PUG’s own website are a little bit optimistic. Above is realistic – and as you can see it’s not really adding a huge amount more volume than without for this particular skirt, but for others it’s much more noticeable. I’ll leave you with an idea of how short it looks on me – and bear in mind I’m 5’1″ so I’d expect it’d be a bit more above the knee on taller ladies. In terms of sizing, by the way, if you fall in-between two sizes like I did, you’ll probably fit into both. Choose the size based on where you want the waistband to sit – if that’s at the waist, you’ll want the smaller size. If you don’t mind it being more towards your hips and a looser, more comfortable fit, you’ll be good with the bigger one. I do find mine snug, but worth it to get volume from the waist. And if you want to see this skirt and the canvas underskirt in further action (albeit with the wind severely knocking them out of shape), check them out in this outfit post. Guess what? The skirt still looks really creased. This is a fantastic idea – I've been wanting to try this one for a while, just haven't gotten around to doing a PUG order. Thank you for this review, it's very helpful to see the photos – there really doesn't look like there is a difference. I never, everrrrrrr wear petticoats because it's too hot for clothes in Australia as it is haha, a petticoat is just too much to bare. Plan on giving this one a go next PUG order! 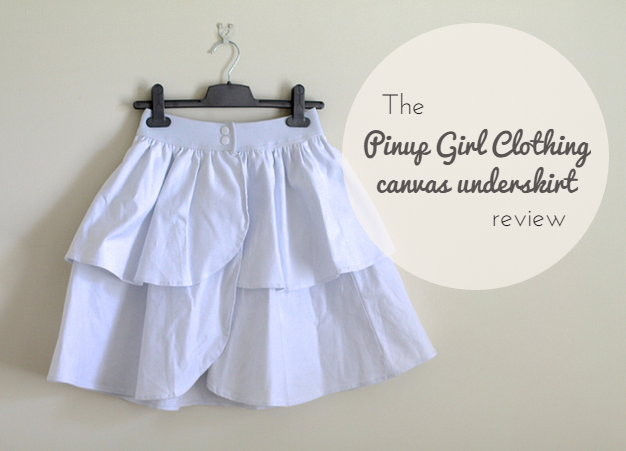 I was so curious about the canvas underskirt – thanks for your review! I think it'd be awesome for summertime when it's hot. That is why I am considering buying one for next summer since pettis can be so stuffy! I do love and prefer my petticoats. I splurge on a brand called Malco Modes. For short girls, their 21" length is awesome for skirts 25" and shorter. I think you'd like the 21" length petti as you are 5'1". I also have a longer Malco Modes that is 26" long for my longer skirts that are 26" and longer. I'm like you, for the most part I don't want my petticoat to show, so this has worked for me the best! Glad to help! I thought I couldn't be the only one who'd wondered about it… I've come across Malco Modes – their petticoats look gorgeous, but quite a bit bigger than I wanted for daily life… Good tips on the lengths, thanks! OK, this could be a complete game changer – I love the way petticoats look, but am totally with you on them being a bit much for everyday life: I always feel like I'm in a costume drama or something when I'm wearing one, so this might be a decent compromise! This might just be the answer for me! I've been debating whether I should wear my petticoat more. I always wear tights so the scratchiness wasn't as much a factor for me as it is just looking a bit OTT for work and generally getting in the way. I put it on under the Voodoo Vixen dress I got at London Edge before work this morning but it was too long. I'm 5'2 so we have the same issues. This looks perfect for everyday wear! With certain petticoats I find that the shape is actually more unflattering because of the bell-like shape. Payday on Friday so I might have to invest in this and some Rago! Seems like that's the general feeling here – it's a solution we didn't realise we were looking for! I really do love how this underskirt doesn't show under most of my clothes, but still seems to work for all lengths. It's probably one of the most useful things abuot it. And I don't like the bell-like shape either! Agreed on this and Rago – both have been gamechangers for me! Agreed, the shape is clearly different with the Pinup Girl canvas crinoline underneath. It looks more, one might even say, professional, if that makes sense. By that, I mean it has the poise and polish of a skirt one might have seen in a fashion magazine back in the day. It's a subtle, but powerful difference and it definitely brings your lovely blue skirt to live all the more. What a great investment piece and way to bring more crinolines (one of my fave underpinning ever!) into your wardrobe. Really cool review. It makes such a difference to see pictures before committing and being disappointed. I have a beautiful greyish pinkish silk petticoat I got on etsy that someone made to my measurements but it is a very full skirt so is a challenge to wear on the train or in the car. Silk is the way to go for a petticoat though, in my opinion- no scratching! Very pricy though, I managed to justify it to myself somehow though! Great review, honey! I haven't tried anything like this, maybe because I don't wear too much of midi skirts. I love this skirt of yours, the underskirt does add some sensible amount of fullness. I only really wear this kind of full skirt at the weekends, but as this goes underneath pretty much all of them it's a very useful staple to have! Thanks for this review. I have been wondering about that petticoat because I use them on models in photo sessions and would like another silhouette than the net version. I really appreciate your taking the time to make those comparison shots–so helpful! Oooh, this is such a good idea! I have a Viven of Holloway petticoat, but it's just too much for every day. I also have a shorter vintage one with less layers, but it can still be a bit of a faff. I shall have to check this out! It's a really good compromise – it definitely isn't VOH petticoat levels of volume, but I really quite like a more subtle lift for daytime and I just find this so much more comfortable and convenient! This is actually really helpful for me, so thank you! I have two petticoats, neither of which has been worn in probably 6 months. They're just too bulky for me a lot of the time, even though I love the look. I'd been thinking about picking this up, but I wasn't sure how much of a lift a canvas underskirt could give. I'd just like something that keeps my skirts from looking totally flat to my legs, and this seems like it would work well for that. Yep that's how I feel too – so much bulk. If you just want something that gives a bit of lift, but not a huge amount, this is basically great for that. It helps things to fall more gracefully, I think.